Spice Route was acquired by Charles Back in the late 1990s out of conviction that the Swartland was utilised and the maiden vintage of this deluxe Rhône-style red blend was 2002, the 2012 the eighth to be released so evidently a few vintages declassified for whatever reason. The 2012 consists of 73% Syrah, 11% Mourvèdre, 8% Carignan and 8% Petite Sirah, the individual components matured for 12 months before blending, the wine returned to barrel for a further 10 months. The nose shows red and black fruit, scrub, earth, liquorice and spice. The palate is rich and smooth textured but also very flavourful, sleek but not entirely devoid of complexity and balance. 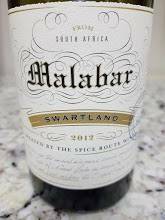 Meanwhile, a slight maltiness suggests that it wouldn’t be out of order to starting drinking it now… Price: R425 a bottle.